To help address the ongoing problem of trash and litter in our community, the city is encouraging community members to help clean, beautify and improve their neighborhoods. Clean neighborhoods benefit everyone! The Come Clean! Program offers multiple ways to get involved. You supply the time, energy and enthusiasm and we will supply the trash bags, gloves and many, many thanks. Businesses and individuals who Adopt-a-Block can request a window cling or lawn sign in recognition of their efforts. Questions? Contact the Come Clean! Coordinator at (651) 266-6130. Anyone can participate in cleanup efforts! Organize your family, community group, employee group, school or religious institution to clean up an area of Saint Paul. The Come Clean! Program provides gloves and plastic bags to collect trash and recycling. You may request an area to clean or ask the City to help find an area for you. Maintain a reliable group of volunteers to follow through with litter cleanup commitments for the date and location(s) agreed upon. Remove the trash and litter from the designated area as needed. Use the designated supply of plastic bags in order to keep the surrounding area clear of litter and other refuse. You may choose to collect recyclable materials (metal, glass or plastic bottles and cans) separately. Depending on the number of bags collected, the participant may dispose of full bags of garbage and/or recyclables in their own container(s). If disposal in your own container is prohibitive, you may request a pick-up of materials. The Adopt-a-Block program is offered to all organized block clubs, neighborhood groups, individuals and organizations interested in cleaning up a portion of their neighborhood in an effort to improve the livability of their community. The Come Clean! 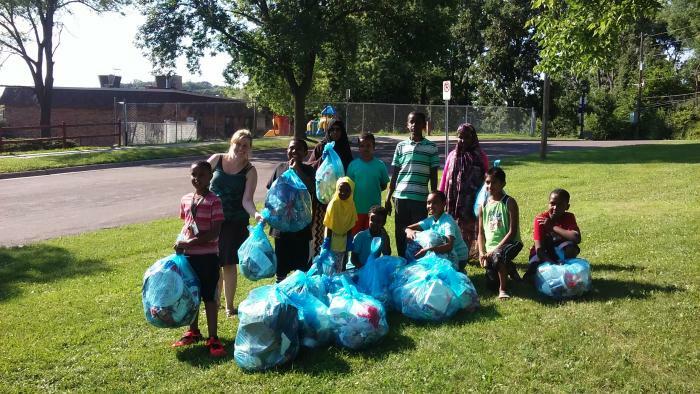 Program provides gloves and plastic bags to collect trash and recycling. Adopt the block for a minimum of two (2) years. Clean the block a minimum of 4 times per year. Adopt all four (4) sides of the block, including the alley if there is one. Clean the public sidewalks, curbs, boulevards and storm drains, corner-to-corner including the alley. Clean up at storm drains may include removing litter and leaves/organic material. Place bagged litter in your own trash container and organic debris in a backyard compost bin or deliver to a Ramsey Co. yard waste site. If disposal at home or delivery to the yard waste site is prohibitive, you may request a pick-up of materials. Residents or organizations can adopt a trash receptacle in order to help combat litter in their neighborhood. The city will provide the trash containers at approved locations. The adoption period is for a minimum of two (2) years. The Adopter agrees to supply and maintain plastic bags in the containers at all times and keep the surrounding area clear of litter and other refuse. The Adopter will remove the filled bags and dispose of them in their own refuse container/dumpster. The Adopter will work in partnership with the City to maintain the physical condition of the litter container. If the container suffers from graffiti or other damage the Adopter will notify the Come Clean! Coordinator. Each year, hundreds of volunteers gather across Saint Paul for the Citywide Spring Cleanup to pick up garbage that has recently become exposed due to the melting snow. This event is organized by the City of Saint Paul Parks and Recreation Department. Visit their website to learn more or to register.